Contact Details : Contact the Authorised Officer, Phone No. 044-2742 6373, 2743 1401, Mobile No. 9940068982. Schedule of Property : All that piece and Parcel of Vacant Land Measuring 15300 sq.ft Dry Sy No. 457, Sy No. 457/1B, Situated at No. 68, Athur A Village Chengalpattu Taluk, Kancheepuram District with Office Buildingn 438 sq.ft Standing in the name of R.Saranya Proprietor of the Firm Boundaries, North : The Proeprty of Radhakrishnan, South : The Property of Radhakrishnan and Govt. Poramboke, East : The Property of Radhakrishnan, West : Chengalpattu -Kanchipuram State Highway. Inspection Details : For Inspection Details Please Contact the Authorised Officer, Phone No. 044-2742 6373, 2743 1401, Mobile No. 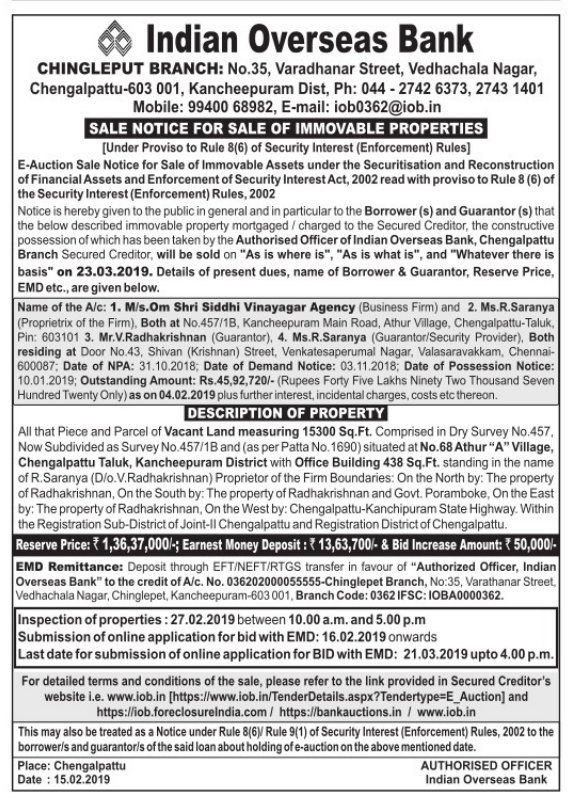 9940068982, Inspection Of The Properties On 27.02.2019 From 10:00 AM To 05:00 PM.